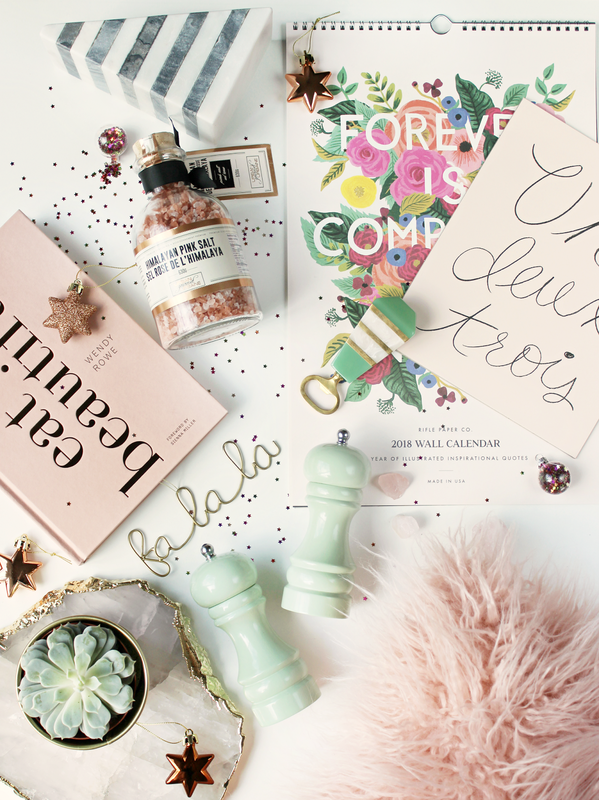 Oooh, probably my favourite gift guide of all… especially for all the home & lifestyle lovers! Anthropologie is usually my first stop for beautiful home and lifestyle gifts and this year is no different! I’m in love with this agate cheese board which would be such a special gift for a hostess. It’s available in rose quartz, amethyst purple and dark green, each with a gorgeous gilded gold trim – it’s a splurge but one that will definitely be loved by anyone who loves pretty things! However, if the price point is a little high, Anthropologie also have some stunning bottle openers which are perfect for the festive season as well. There are lots of wall calendars around in preparation for the new year and one of my favourites is this one from Rifle Paper Co. It would make such a wonderful gift for stationery lovers who like to keep everything organised! The quotes and prints on this particular design are so vibrant and gorgeous – I’ve already put mine up in the kitchen ready for the new year. Rifle Paper Co. also make the most gorgeous art prints which make a great gift for someone who loves to decorate – I am totally smitten with this blush pink print which I picked up for my gallery wall. A pair of salt & pepper mills would make cute gift, especially if they’re in a unique style or colour. I recently purchased these traditional style mills in vintage green and they make a lovely talking point when hosting. 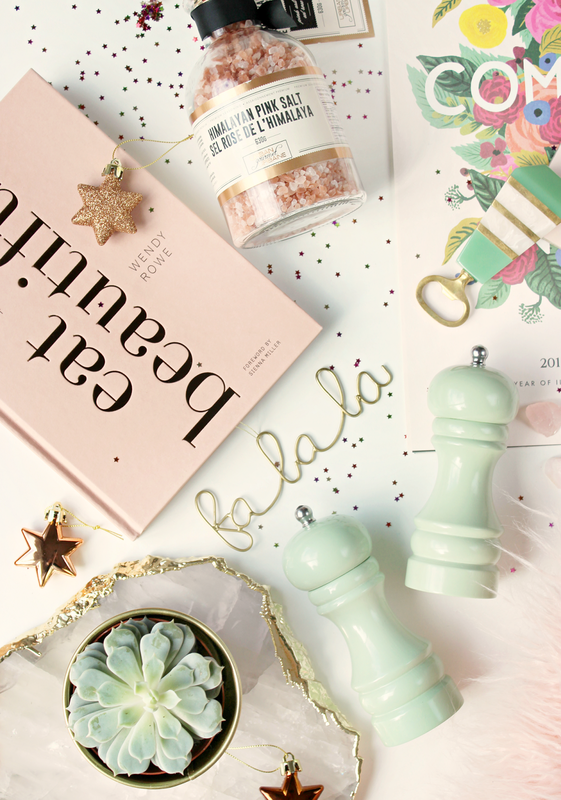 Accompanying the mills with some pretty salt would make the gift extra special, and it doesn’t get prettier than a jar of pink salt in a fancy bottle! Beautiful books also make great presents when you don’t know someone that well. I love to read coffee table books and receiving them is always a real treat. Some of my absolute favourites are Eat Beautiful by Wendy Rowe and How To Be Parisian Wherever You Are. West Elm have some marble bookends which would also make a gorgeous gift – I bought this one last week and I love using it to prop up my cooking books in the kitchen. Soft furnishings are a really gorgeous gift for home lovers, and unwrapping a beautiful geometric print throw would be a wonderful surprise. I know Mongolian fur cushions have been all the rage recently and I’ve chosen several to fill up spaces on my sofa and bedspread! They would definitely make such a statement gift for someone who loves to cosy up on the sofa with a good book or to watch TV. A little tip: if you’re on a budget and you still want to give something super special, a cute cacti or house plant would be perfect. IKEA have some gorgeous brass plant pots for a little over £1 which instantly make any little plant look a lot more luxe! What are your favourite gift ideas for home & lifestyle lovers? Previous Post Gift Guide: For Her. Next Post Gift Guide: Stocking Fillers.